I love milk glass. It is so romantic and feminine. Normally, the jewelry that contains milk glass beads or stones is plain white, so it was lovely to come across this stunner with translucent blue stones as well. The brooch is set in silvertone metal and has a slightly layered and curved design. 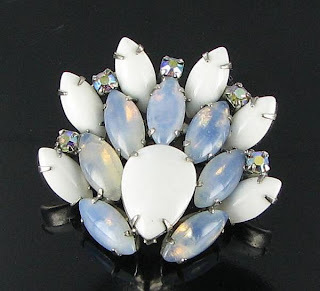 There are alternating rows of pure white milk glass and translucent blue glass in prong settings as well as lovely aurora borealis rhinestone accents. The bottom center of the brooch features a single tear shaped large milk glass stone. The size is 1 3/4 x 1 5/8". 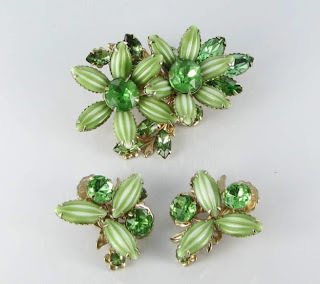 It is available from my Ruby Lane shop - Finishing Touch Vintage Jewelry for only $36. Hurry - it won't last long at this price!